After all the buildup, the holiday is almost here! Are you as excited as I am? Thinking about all the goodies that will be at our holiday table makes it pretty much a guarantee that there will be much overindulgence over the course of the next few day in our house, and I figure it’s probably the same with you, so since we’re all in the same boat, I thought I would balance things out a bit with this healthy, sensible and super easy seasonal salad. It’s a snap to make. particularly if use a food processor to shred the brussels sprouts (or you could even buy them pre-shredded from the market) and a great thing to have on hand, all ready to eat. Makes it a whole lot easier to resist leftover stuffing and cornbread!! The flavor and texture combo just can’t be beat. 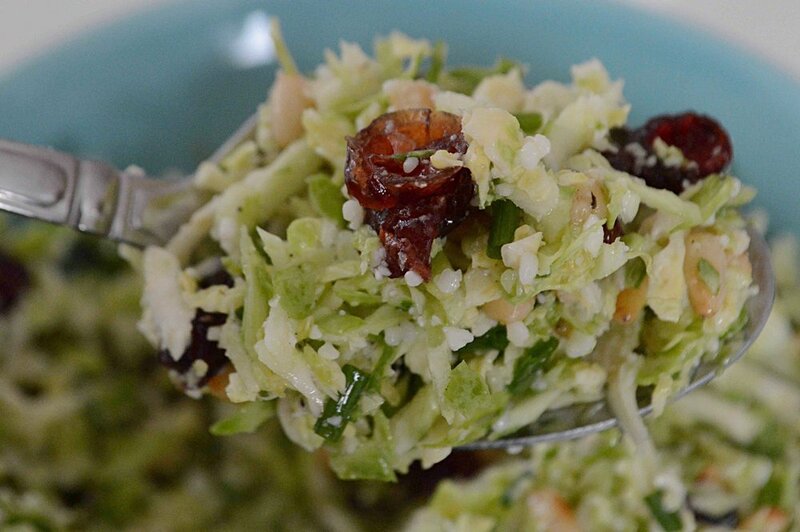 Who knew that raw brussels sprouts could taste so good?!! When combined with the crunch of toasted pine nuts, the tang and chewiness of dried cranberries, the saltiness of pecorino romano cheese and tossed in a light lemon vinaigrette, they just can’t be beat. Honestly, if you have room for it on your holiday table and you’re looking for an unique light side or another vegetarian offering, you really can’t go wrong! i love both of these, Foolproof Parker House Rolls and One-Pan Buttermilk Dinner Rolls —don’t know if I can squeeze them in-I need a full time staff!! This Chocolate Caramel Tart I just shared—absolutely divine and easy! Maybe my DIL Lauren will bake some cookies or make another dessert because she’s such a good baker and of course we need something to nibble on!! 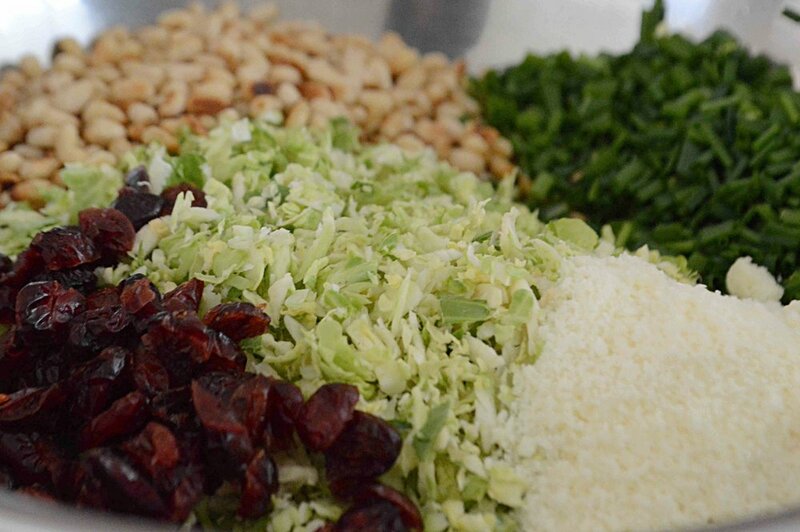 Place all the ingredients in a large bowl and toss together. Let sit for about 10-15 minutes for the flavors to meld together, toss again, taste and adjust seasonings if necessary and serve. You can also make this ahead and store in an airtight container in the fridge for several days. Note: Recipe adapted from The Love & Lemons Cookbook by Jeanine Donofrio.